A crust of shortbread cookie crumbs and pecans is filled with a brown-sugar-laced pecan mixture for a luscious pie that tastes like praline candy. Preheat oven to 350°F. Reserve 8 pecan halves for garnish. Finely chop 1/2 cup of the remaining pecans. Melt 1/4 cup of the margarine; pour into small bowl. Add 1/4 cup of the finely chopped pecans and the shortbread crumbs; mix well. Press firmly onto bottom and up side of 9-inch pie plate; set aside. Melt remaining 1/4 cup margarine; pour into medium bowl. Add sugar; beat with electric mixer on low speed until well blended. Add flour, egg, baking powder and vanilla; mix well. Stir in remaining pecan halves. Pour into crust; sprinkle with remaining finely chopped pecans. Bake 18 min. or until lightly browned. 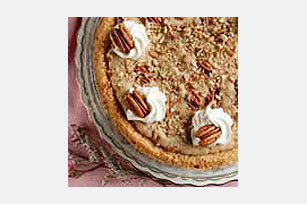 Serve warm or chilled topped with the whipped topping and the reserved pecan halves. This elegant dessert is extremely indulgent, so enjoy it only on special occasions.